Shai Tahan, 18, acknowledged that on first arriving in the United States, he had quite a bit of anxiety. 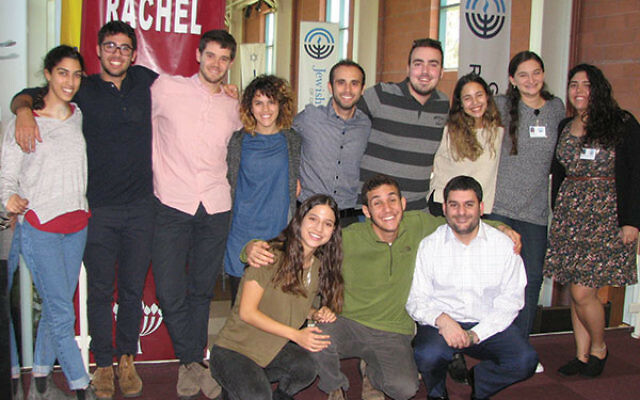 Part of a delegation of 10 shlihim — emissaries from Israel — who traveled to New Jersey this summer, the Rosh Pina native has now had time to settle in and is actually “having fun” working with Jewish children. The shlihim are brought to New Jersey by the Jewish Federation of Greater MetroWest NJ to add a taste of Israel to the local community. Seven of the 10, including Tahan, are rishonim (recent Israeli high school graduates who sign on for shlihut before their army service as a kind of gap year). They work with local youth in day schools, religious schools, synagogues, and community centers, and live with host families. The other three emissaries are older, usually in their mid-20s, have completed their army service and university studies, and are professional educators. They will live in the community for several years. In addition to Tahan, the rishonim include Roni Belkin, Oz Attar, Gili Veltz, Coral Sasson, Noach Korin Gilady, and Stav Khoubian. The new shlihim are Michael Levi, Danielle Perlmutter, and Yosef Perlmutter. They join Moran Shevach, who has already completed the first year of her stay. He started sweating every time they went somewhere new. By mid-October, the emissaries were operating in a regular routine, working with students at area venues. They spoke with NJJN about their experiences so far; the following are edited excerpts from the conversation, held Oct. 10 at their headquarters in the federation offices on the Aidekman campus in Whippany, where they are led by community shaliah Moshe Levi. Yosef Perlmutter, 24, of Jerusalem, however, did not feel as distanced as the others. “It was so strong worldwide. The news of his passing was everywhere. So I didn’t feel the distance from Israel was so significant. I feel the distance more with things I can’t hear about while I’m here,” he said.